Staff from Combined Task Force 150 (CTF 150) recently visited the Jordanian Royal Naval Force Headquarters in Prince Hashem ibn Abdullah Naval Base, Aqaba as part of a program of regional engagements. The visits focused on opportunities for improving maritime security in the Combined Maritime Forces (CMF) area of operations by enhancing cooperation and increasing understanding of Jordan’s maritime capabilities. 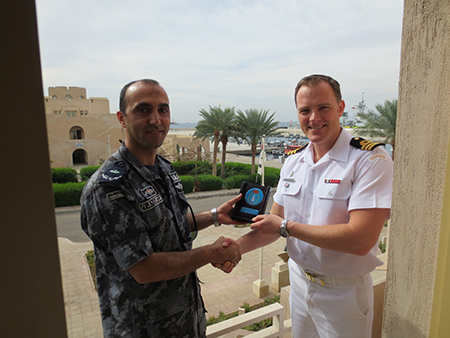 Major Hisham Al-Faragh, Royal Jordanian Naval Force, presents a plaque to CTF150 Director Plans and Exercises CDR Trevor Maclean, Royal Canadian Navy. Commander Trevor MacLean, Royal Canadian Navy, is currently the Director Plans and Exercises with Australian command staff for CTF 150 based in Bahrain. His visit to Jordan included a tour of the Royal Jordanian Navy Headquarters hosted by Major Hisham Al-Faragh. “I genuinely appreciated the opportunity to spend this time with my Jordanian colleagues,” Commander MacLean said.